D-Galactose is a monosaccharide sugar that serves as an energy source and glycosylation component. It is a C-4 epimer of glucose and often used as a source of carbon in culture media. 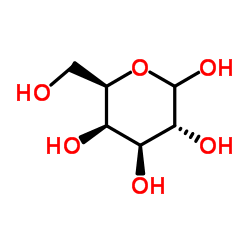 Galactose is a component of the disaccharide lactose and released upon hydrolysis by β-galactosidase enzymes. It is converted to glucose via the Leloir pathway or metabolized via an alternative pathway, such as the DeLey-Doudoroff pathway.